I just discovered a fantastic body lotion duo made in beautiful Jackson Hole, Wyoming. It’s pharmacy-recommended TRILIPIDERM All-Body Moisture Retention Creme, available with and without SPF. By utilizing natural, plant-derived ingredients, TRILIPIDERM hydrates your skin while preventing water loss and replaces essential lipids for both men and women with dry skin. 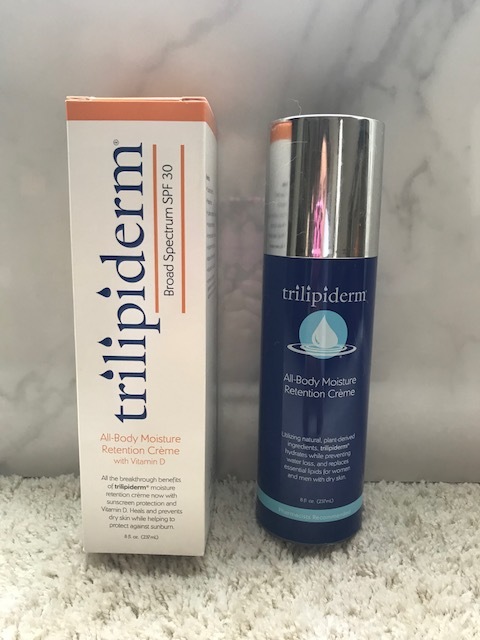 In addition, all the breakthrough benefits of TRILIPIDERM is now available with sunscreen protection and Vitamin D. It heals and protects dry skin while helping to prevent against sunburn with an SPF 30. TRILIPIDERM is paraben-free and does not contain petrolatum or greasy mineral oil. This fast-absorbing lotion promotes the hydration of your skin cells and restores vitally-needed lipids while improving the tone, texture and appearance of your skin, leaving it soft, supple and younger-looking. Moreover, both body cremes are non-comedogenic and cruelty free; not tested on animals. TRILIPIDERM even features an array of amino acids and Vitamins A, C, D & E.
The ingredients are wonderful-a harmonious combination of natural ingredients uniquely designed for you, including jojoba, to keep your skin moist and healthy, chamomile and calendula to soothe and heal your skin from wounds and inflammation, plus meadowfoam to significantly improve the tone and texture of your skin. If you’re searching for an easy solution to dry skin, TRILIPIDERM is the moisturizer your skin craves. To score your complimentary lotion, simply fill out and submit the contact form on this site or email cwris@yahoo.com to enter to win. Be sure to include your shipping address, email and phone number. Two winners chosen at random will receive a full-size TRILIPIDERM body crème! Now available in the Sacramento and North Bay areas at Nugget Markets and online at http://www.trilipiderm.com. TRILIPIDERM-inspired by nature, created for you.